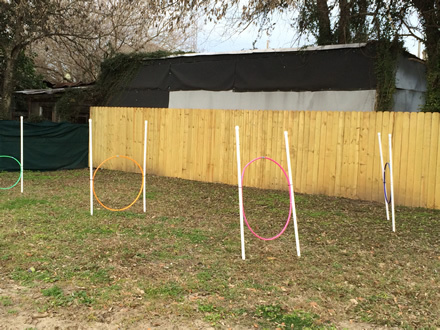 Barkey Park is a privately owned and operated dog park behind the Historic Wiltz Gymnasium. 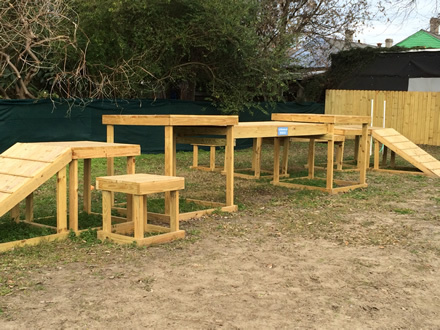 Our facility inside the gym also offers professional pet grooming, a doggie day care, positive reinforcement dog training, and The Nola Bark Market, a full line Pet Supply store specializing in healthy, affordable food at competitive pricing. While we specialize in large dogs’ needs, we cater to all sizes of dogs as well as cats! 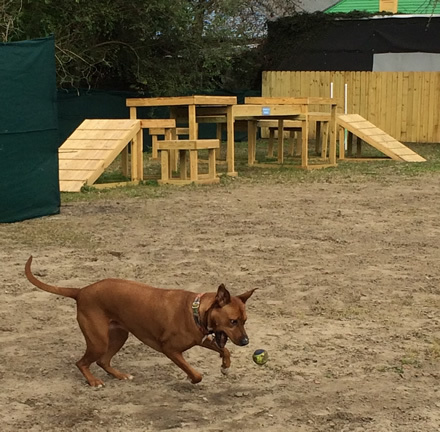 This 1/4 acre dedicated open dog park is designed to be a working park to exercise, train, throw balls and run your dog, and you will often have the park to yourself. Barkey Park is a working park, not a social park. This park is NOT a place where you are guaranteed to find a pack of dogs to socialize with. This is particularly useful for dogs that “don’t play well with others”, fearful or anxious dogs, and dogs that are un-socialized. Click here to download a Barkey Park Membership Application. 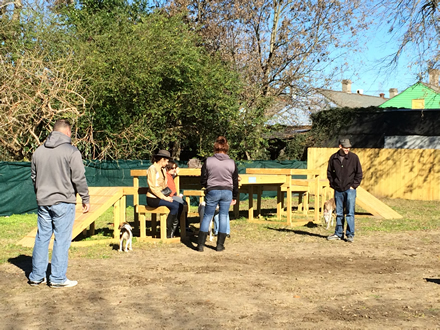 Barkey Park is available to rent on weekends for private use for Doggie Birthday Parties! The cost is $45 for 2 hours, $15 for each additional hour. Call for reservations and details! We offer a full schedule of 6 week obedience classes as well as one day workshops, too numerous to keep updated on the website! Please call the store for current offerings, or check our Facebook Page in the Events listings. Why are there no chairs in the park? The number one cause of dog aggression in dog parks are chairs! During the short time you are at the park, your focus must be on your dogs. With chairs come socializing with your friends, checking your cell phone, reading books, etc., and the focus is taken off the dogs. We want Barkey Park to be a positive experience for everyone, and help to increase the bond between the dogs and owners! Your dog has never been to a dog park? Not sure how they’ll act? We can help! We work with a variety of trainers and behaviorists, and we can help assess your dogs ability to interact appropriately in the park, and can offer training and remedies if they need some work. Check below for tips and details! You have read the rules and signed that your dog is spayed/neutered, over the age of 6 months and up to date on all inoculations, But there is more you should consider before bringing your dog to a dog park. NOT ALL DOGS ARE CANDIDATES FOR A DOG PARK—there are some great dogs that just do not belong in a dog park. Thoughtfully read the following questions and comments to help you determine if the dog park is a place for you and your pet. Is your dog a rescue and or newly adopted? If you and your dog are new to each other and not completely bonded it is best to wait until you are confident that he is a good candidate for the park. Your dog needs to know that you are in charge and that he can trust you. Has your dog been socialized and accustomed to interacting with other dogs? Learn your dog’s tolerance for other dogs and dog play situations before bringing him to the park. Your dog will benefit from play with other dogs in a smaller social situation such as a doggie day care or at home with friend’s or relatives’ dogs before experiencing the hectic environment of the dog park. Is your dog fearful or anxious? If he fears other dogs and high-activity, he will probably not be happy at the dog park, especially at busy, crowded times. Again, socialization on a smaller scale and then when he is ready at the dog park during times of low activity would better suit your pet. If your dog is aggressive toward other dogs or people, visits to a dog park will escalate this behavior and put your pet and other people’s pets at risk. If you wish to change your dog’s behaviors, you should work with a qualified dog behaviorist and socialize your dogs behavior before joining the dog park. Dogs that have ever bitten atoner dog or human that had to be medically treated should be carefully evaluated by a trainer as to their suitability for a dog park. DOGS WITH AGGRESSION ISSUES SHOULD NEVER BE IN THE DOG PARK. Some dogs, whether it is due to innate personality or learning experience just don’t play well with others. A dog who provokes fights and if the behavior is allowed to continue the dog is intrinsically rewarded to the behavior and the bullying will worsen over time. Is your dog a doggie dork? Some dogs lack social skills. They don’t bully on purpose, but they don’t play politely and just seem socially clueless. They don’t know their space or respect other dog’s space. They are high in energy levels and play rough. They don’t know how to read the signals from the other dogs to back off and stop the rough play; they just don’t understand the other dog’s attempt to communicate. They can hurt people and other dogs, and the cause of a fight, even though they are not internally aggressive. 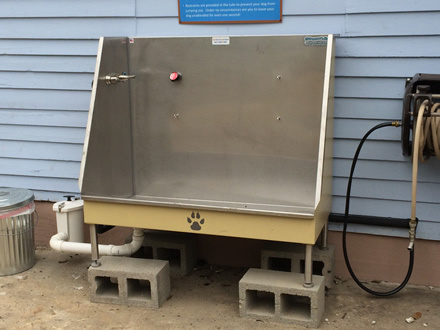 A doggie dork would also benefit from lesson s with a dog behaviorist before coming to the park. *Personality Profile borrowed from New Orleans City Bark! Recognize that your dog may not get along with ALL other dogs, and that some combinations simply don't work. It is fine to leave the dog run and come back another time, or take a personal, one-on-one walk with your dog in the neighborhood and come back in a few minutes to see if the run has emptied out a bit. Consider leaving your cell phone off, or not taking calls, unless it's an emergency, during your dog's time at the dog run. The more attention you give your dog, and the more you participate, the better the relationship. This is a good time for you and your dog to be together, and doesn't your dog deserve your undivided attention? Make sure your dog's play partner(s) are playing fair, and that your own dog is playing fair, too. This means that each dog takes turn pushing and initiating physical contact (being on top) and that neither dog is pushing another dog relentlessly. There should be frequent role reversals in healthy play. Make sure your own dog is actually playing with another dog, and not just responding in a defensive, deflective way based on fear. Call your dog to you, and when you release him to go back to "play," see if he indeed does return to engage with the same dog(s). If not, he may not have felt that what he was previously experiencing was really playful or fun for him. Watch your own dog, and make sure he is not targeting ONE other dog exclusively and going after that particular dog relentlessly - even if you think your dog is "just playing." Playing is a balance between the dogs, a give and take - not one dog pushing and jumping and mouthing the other dog over and over and over again. If your dog is doing this to another dog, go and get him, or call him to you and get him under control. The same holds true if your dog is the target of another dog's obsession. Go and rescue your dog from the situation. Watch out for "ganging" up; when two or more dogs "gang up" and relentlessly chase or surround another dog. Have all the owners call their dogs, and probably one or more of the gang members should leave the run for that time, as they'll usually start back up again. Toy dogs should play with other toy or smallish dogs, and should absolutely not be in the run with the big dogs. A predatory attack can happen instantly and without warning. The risk to toy dogs is too great. Beware of high-speed games of chase. Alone, two dogs playing chase is probably fine, but if other dogs join in, then a high-speed game of chase can arouse other dogs, and in an instant this can turn into a predatory attack. It's hard to get control once dogs begin this high-speed chase, which is why you want to catch it early, and why you want to spend a lot of time training your dog in the run. You want control when your dog starts to get out of control. But you can't wait until he is out of control to train your dog to listen to you. Train him while he is relatively calm. 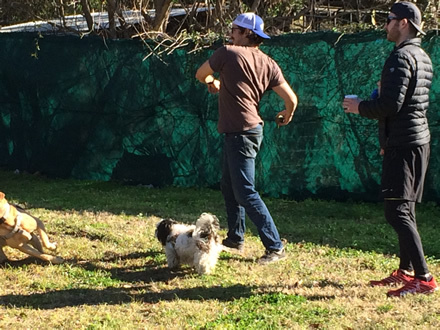 Participate in your dog's playtime. Interrupt every few minutes by calling your dog to you, rewarding with at least one treat every two seconds, and keep your dog with you for at least 10 seconds. For this entire 10 seconds, praise, pet and reward your dog often enuogh so that he doesn't have a chance to look away from you. This encourages attention, and allows your dog to calm down and focus on a human in between aroused playtimes. Playing with other dogs is very, very fun for your dog, sometimes more fun than being with people, and sometimes more fun than being with YOU. This puts you at a disadvantage in every other situation with your dog. It is important to include yourself in your dog's play activities. Watch your dog, encourage your dog, interrupt your dog, play with your dog. Call your dog to come to you frequently, not just when it's time to leave. 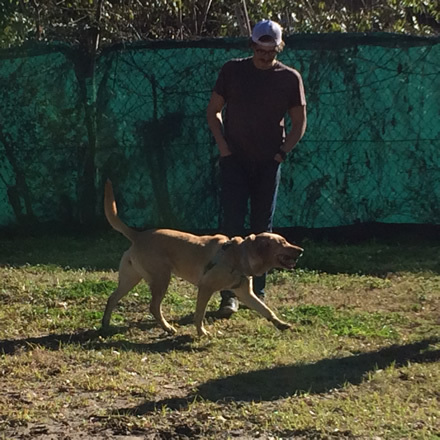 By calling him over to you frequently, rewarding him with something valuable, and then releasing him back to play, you can avoid the difficulty many dog park frequenters experience: the dog who can't be caught when it's time to leave. Make sure that calling your dog to come to you doesn't just signal the time to leave. By calling him and having him sit by your side, receive your praise and petting for a brief time before releasing him with permission to go back and play teaches your dog that coming to you is merely a pleasant interruption, and not an end to his fun. The above information is taken from Sue Sternberg's book, Out and About With Your Dog available from www.greatdogproductions.com. 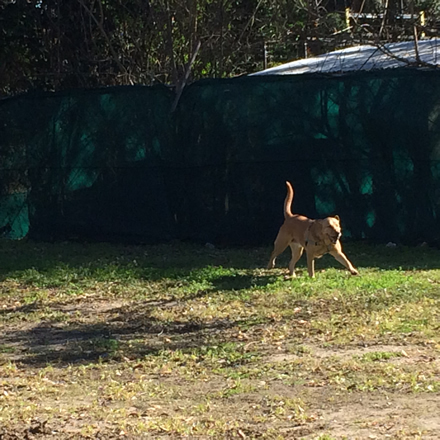 *Note: The dog park is used primarily by our Doggie Day Care during the week.